Wheat (Triticum aestivum L.) is the second most important staple crop in South Africa, with an annual consumption of over 3 200 000 t (Directorate Statistics and Economic Analysis 2015). There is a wheat production crisis in the country as current production fails to meet demand. The country currently produces 1 800 000 t wheat grain annually, and must meet over 40% of the domestic demand through imports. In order to avert the looming food security crisis over potential wheat shortages, a strategic goal for the country’s agriculture is to at least double wheat production by 2030. South Africa’s major wheat breeding goals over the years have been primarily to improve pest resistance, grain yield and grain quality. Much progress has been made with regards to grain quality improvement such that nearly all South African cultivars have acceptable end-use characteristics in terms of milling, rheological and baking properties (Smit et al. 2010). These quality parameters are enforced by the South African Grain Laboratory (SAGL) in conjunction with millers and bakers associations (Mncube 2014). However, there has been no regulation regarding minimum acceptable yield for cultivars. Popular opinion is that strict quality regulations might have negatively impacted wheat yield improvement in the country. At present, wheat production is becoming less economically viable for many producers (Mncube 2014). There is a general sentiment that wheat yields could be much higher for cultivars that do not comply with current quality standards. Worldwide, there areincreasing calls on breeders to place more focus on yield to curb food insecurity (Guzmán et al. 2017). Genetic improvement of wheat yield is relatively more difficult when compared with other staple crops such as maize (Zea mays L.), in part due to the complexity of its genome and its strict self-pollinating nature (Reynolds et al. 2012; Slafer et al. 2014). Wheat yield is a polygenic trait that is controlled by several genes of minor effect with genes located on 21 chromosomes (Röder 1998; Quarrie et al. 2006; Snape et al. 2007). The problem is that most of the yield-related genes have not yet been mapped, molecular markers tightly linked to these genes are not available, and genes and quantitative trait loci (QTLs) that have been identified are rarely used through markerassisted gene introgression (Cui et al. 2014; Edae et al. 2014). There have also been limited scientific studies aimed at understanding the genetic yield progress of wheat attained through breeding efforts in South Africa. Periodic evaluation of the rate of genetic gain in grain yield is important to determine the effectiveness of current breeding efforts and to check whether increased wheat demands by the growing population will be met. The general sentiment is that genetic wheat yield gains in the country have been minimal over the past decade, and that yield potential of South African cultivars has remained low, resulting in low profitability of the crop. South Africa’s wheat yield data from the past decade shows increasing average national yield trends (Directorate Statistics and Economic Analysis 2015). There was, however, a significant drop in the production area over the same period. It is not clear how much of the yield progress can be attributed to genetic gain from new cultivars, favourable climatic factors or refinements in agronomic crop management practices. The international trend in genetic wheat yield progress has been 0.5%–1.0% y−1, and in some places genetic yield stagnation has been reported (Brisson et al. 2010; Aisawi et al. 2015). Genetic gains of <1% y−1 are insufficient to meet global future demand (Reynolds et al. 2012). At least 1.5% y−1 is required to guarantee food security into the future (Robertson et al. 2015). One of the widely applied methods for estimating genetic yield gain is conducting replicated yield trials for entries released at various time periods compared with standard/ control cultivars (e.g. Graybosch and Peterson 2010; Manes et al. 2012). Since the 1990s, the Agricultural Research Council–Small Grain Institute (ARC-SGI; 28°09′55.12″ S, 28°18′32.97″ E) of South Africa has conducted replicated yield trials for new wheat cultivars under the National Wheat Cultivar Evaluation Program (NWCEP) annually. Three major breeding institutions in South Africa, namely ARC-SGI, Pannar and Sensako entered their new cultivars into this program on a regular basis. Thirty-one spring type irrigation cultivars were released from 1998 to 2014 and were tested across all the major irrigation production areas of South Africa. The objective of the current study was to examine the genetic gains of grain yield in the irrigation production regions of South Africa for the period 1998–2013 using NWCEP yield data. Irrigation wheat is produced in many areas of South Africa with adequate water for irrigation and suitable soils. The irrigation wheat production areas of the country are categorised into four main geographic regions based on agroclimatic and geographical features. The regions are mainly the Cooler Central irrigation area, the Warmer Northern irrigation area, the Highveld area and KwaZuluNatal province. Under the NWCEP, cultivar adaptation trials were planted each year on farmers’ fields at several designated locations (within production regions) using a randomised complete block design with four replicates. Seed rates of the different cultivars were calculated according to 1 000 kernel mass. All cultivars were planted at the same number of plants per square metre. Seeding density at the earlier plantings in the Cooler Central, Highveld and Warmer Northern areas were 225 plants m−2, and 275 plants m−2 was used in KwaZulu-Natal to compensate for reduced tillering under the warmer conditions. Plots consisted of eight rows of 5 m length. Fertilisation was optimised through the use of soil analyses, and target total fertiliser application was 220 kg N ha−1, 30 kg P ha−1 and 20 kg K ha−1. Irrigation scheduling was according to farmer practice as all the trials were planted on commercial wheat fields under centre-pivot irrigation systems. The objective of the NWECP was to evaluate the grain yield potential of cultivars on pest- and disease-free trials. As such, chemical control was applied whenever necessary to keep the trials free of weeds, insect pests and plant diseases. Given that trials were planted inside the wheat crops of commercial wheat farmers, much of the weed, pest and disease control was carried out by the farmers. Additional weed control was performed whenever necessary by the researchers and the trials were always kept weed free. In addition, Bumper® 250 EC fungicide (propiconazole 250 g L−1) was sprayed at the rate of 800 mL ha−1 on all trials against karnal burnt (Tilletia indica). All seeds were treated with Gaucho® (imidacloprid 350 g L–1) for control of early infestation by aphids (mainly Diuraphis noxia). The trials were harvested when the wheat grains passed the ripening stage. This is the stage when stems and ears discolour to yellow, kernels can no longer be dented by a thumbnail, and the grain moisture content is less than 20%. The plots were harvested with a Wintersteiger® plot combine harvester, and the harvest area was 5 m × 1.35 m, represented by the three central rows. Following harvest, seed was cleaned to remove chaff using a Pfeuffer sample cleaner (model MLN), flue dried to a moisture content of approximately 12%, and then weighed to record grain yield. Moisture content (%) and seed density, also called hectolitre mass (kg hL–1) were measured by filling wheat grain into the Agri-TR instrument’s hopper. The minimum acceptable seed density for bread wheat cultivars in South Africa is 72 kg hL–1 at a moisture content of 12%. Wheat grain samples were ground into flour and further evaluated for protein content using a NIR analyser (FOSS Infratec™ 1241 Grain Analyser). This instrument was recalibrated to analyse protein content from flour samples. Days to flowering were recorded as the number of days from sowing to 50% heading. The NWCEP irrigation trials consisted of approximately 30 entries annually. Poorly performing cultivars were constantly replaced with high yielding ones in the program. Over the 15-year period of investigation from 1998 to 2013, 31 spring type irrigation cultivars were released and entered into the program (Table 1). Three cultivars that were released in 1992, namely ?SST 822', ?SST 876' and ?Kariega', remained in the program for an extended period up to 2013 and served as check or control cultivars for the yield gain study. Replicated grain yield data from the NWCEP for the 15-year period were summarised using means, standard deviations and coefficients of variation (CVs). Before the data could be used, it was validated to check and remove recording errors. For each entry, grain yield data were converted into relative values by expressing each entry mean as a percentage of the response of the mean yield of checks (SST 822, SST 876 and Kariega) obtained from the same geographical region. Regression analysis was performed to evaluate relationships between relative yield values and calendar year of the field trials. Separate regression analyses were performed for the different geographical regions using all new entries, as well as the new entry with the highest grain yield. Significance of the regression slopes was tested by linear regression t-tests using GenStat® 15th Edition statistical software (Payne et al. 2013). An unbalanced analysis of variance was carried out on yield data of check cultivars to determine the significance of differences in mean yield across geographical regions and blocked by years. Spearman’s rank correlation tests were performed to establish the relationship between wheat grain yield and various other parameters, namely hectolitre mass, grain protein content, falling number and days to flowering. Mean grain yield of the check entries is presented as a function of year in Figure 1 for all four geographical regions. Average yields were highest in the Cooler Central area and lowest in KwaZulu-Natal (Table 2). Given that management of the cultivar evaluation trials remained the same over the 15-year period, large CVs of check cultivars presented in Table 2 show that there were considerable year-toyear variations in mean yield. South Africa is experiencing extreme weather events due to climate change, and these include high seasonal temperature variability (Wiid and Ziervogel 2012; Pasquini et al. 2013). Linear regression of check yield against year was not significant (p > 0.05) for all geographical regions (Table 2). This suggests that although there was large year-to-year variation, there was no significant overall change in the yield potential of the check cultivars over the evaluation period. High CVs (>10%) were obtained when the means of all entries were considered (Figure 2), showing that there were considerable differences in yield of entries evaluated within the same localities. This indicates that cultivar choice was an important consideration for improving yield of irrigation wheat. The interactions between growing environment and year (Figure 1) suggest that certain new cultivars are more adapted to certain geographical regions than others. Currently, there are many irrigation wheat cultivars on the South African market and it is important that all producers be fully informed on cultivars that perform best in their region. Mean yield was lowest in KwaZulu-Natal (Table 2). Coefficient of variation for yield was also highest in this region. There has been widespread adoption of no-till practices over the past decade in this region. KwaZuluNatal is warm and humid, with a high prevalence of wheat diseases such as Fusarium root rot in this region. A recent survey showed that the majority of irrigation wheat farmers in this region now practice conservation agriculture, and in most cases with a no-till component (Sosibo et al. 2017). Yield response to no-till is known to be highly variable and, more often than not, no-till is known to reduce crop yields when compared with conventional tillage (Pittelkow et al. 2015), especially when not combined well with the other two principles of conservation agriculture, namely crop rotation and permanent crop cover (Corbeels et al. 2014). It is possible that the practice of no-till agriculture is the reason for poor performance and low yield stability of irrigation wheat cultivars in the KwaZulu-Natal region. Reid et al. (2009) suggested that spring wheat breeding for organically managed systems be conducted on organically managed land, as their experiments showed that indirect selection in conventionally managed trials of spring wheat destined for organically managed production would not result in the advance of the best possible lines in a breeding program. It may be that genetic yield gains could be better if selection for yield improvement in KwaZulu-Natal is done under no-till. KwaZulu-Natal, where phosphorus (P) deficiency and acidity are serious problems on no-till fields. Genetic variation in P utilisation efficiency of wheat has been documented by several researchers (e.g. Jones et al. 1989; Zhu et al. 2001; Ozturk et al. 2005). Therefore, breeding for improvement of P utilisation efficiency is a possible solution for mitigating the P management problems in KwaZulu-Natal. Over the past two decades, South Africa has generally had a lack of investment for wheat breeding compared with other crops such as maize, and this could be one of the reasons for a lack of genetic yield progress for the crop over the period. It is envisaged that the new end-point royalty system for wheat will encourage greater investment in wheat improvement (Purnell 2016). Wheat is self-pollinated, and the lack of investment into breeding by private companies was largely caused by the retention of farm-saved seed, which resulted in the industry being less profitable. A new Plant Breeders Bill was passed in 2015, and the South African Cultivar and Technology Agency (SACTA) was mandated to collect royalties or levies for wheat delivered to silos at approximately R25 t−1. This levy will be used to compensate breeding companies that release popular cultivars and encourage breeding work. The relationships between grain yield and hectolitre mass (seed density) were positive in all regions (Table 4). Figure 3 is a graphical representation of the significant positive relationship between mean hectolitre mass and mean grain yield of the cultivars. It appears that high grain yields were associated with high hectolitre mass. Better genetic yield progress may be achieved through increasing seed density based on its significant and strong positive relationships with grain yield (Figure 3). Significant negative relationships between grain yield and protein content were observed from all geographical regions except the Warmer Northern areas. The relationships between grain yield and protein content have been reported in several studies (Fischer et al. 1993; Subedi et al. 2007; Bogard et al. 2010). Although these traits are reported to be negatively correlated, there is also scientific evidence showing that this inverse relationship is not entirely caused by genetic factors, but rather by environmental factors, source–sink interactions, and dilution of protein by non-protein compounds (Kibite and Evans 1984). In addition, Groos et al. (2003) reported that there were no negative relationships between some QTLs for yield and grain protein content. Similarly, Tsilo et al. (2010) reported several grain protein and grain yield QTLs that were independent of each other in hard red spring wheat types, implying that accumulation of all grain yield QTLs or favourable alleles that are independent of grain protein content is possible as a means to increase grain yield without negatively reducing grain protein content. 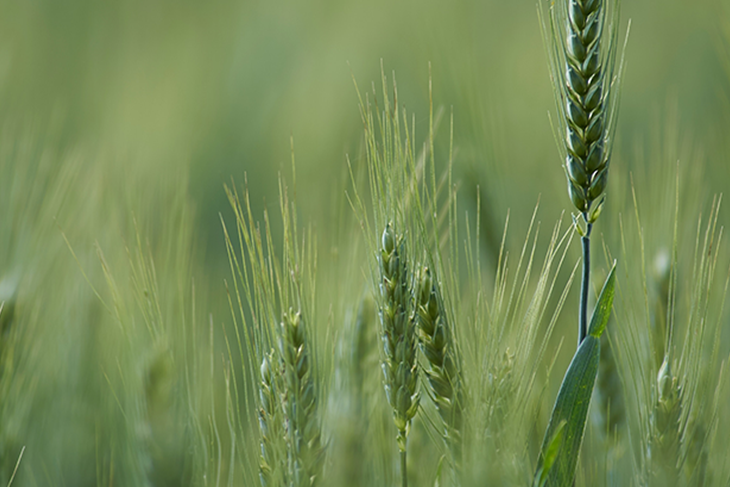 The ARC-SGI's National Wheat Cultivar Evaluation program evaluates new cultivars for yield performance and stability across production regions in South Africa. Data generated from all entries evaluated in the Eastern Highveld over the period 1998–2013 indicated genetic gains in grain yield of about 0.82% y−1, whereas the highest yielding entries progressed at ≈1.17% y−1. The grain yield of cultivars evaluated in the Cooler Central areas increased at a rate of 0.40% y−1, whereas non-significant yield gains were recorded in the Warmer Northern areas and KwaZulu-Natal province. The present yield trends need to be enhanced through new breeding strategies that are directed at increasing grain yield and yield components of wheat whilemaintaining acceptable end-use quality. New investments need to be made in order to achieve rapid increase in yield gains and to increase wheat productivity in South Africa. The authors are thankful to the Production Systems Division of the ARC–Small Grain Institute for conducting National Wheat Cultivar Evaluation trials over the past three decades and providing the data used in this study. The contributions of all ARC–Small Grain Institute staff are acknowledged. The Winter Cereal Trust and National Research Foundation are acknowledged for funding the yield gaps of irrigation wheat project in South Africa, from which this study emerged.